What did de Montfort Mean By “True Devotion to Mary”? 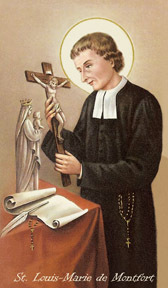 Yesterday the Church celebrated St. Louis-Marie Grignion de Montfort (1673-1716), a French priest and author of the important treatise “True Devotion to Mary.” Mother Teresa thought this book was important enough that he should be named a Doctor of the Church. St. John Paul II chose his papal motto to refer to it: Totus tuus, “totally yours,” was one of de Montfort’s formulations of Marian devotion. But what did de Montfort mean by “true devotion”? This section of the book suggests six other “exterior practices,” from wearing little chains to praying the rosary and the Magnificat, to “contempt of the world,” as exterior ways to nurture interior devotion. Consecration is parallel to these other devotions – and all of them are secondary to de Montfort’s real concern. De Montfort is at pains to prevent us from “false devotion.” His section on false devotion is more than twice as long as his section on consecration. False devotion is insufficient devotion – but there are different kinds of insufficient devotion. “Scrupulous devotion” is afraid that if we think about Mary too much, we will forget Jesus. Much of de Montfort’s book tries to explain why this is not true: true devotion to Mary always leads us closer to Jesus. But other kinds of false devotion are, in an interesting way, different but similar to this insufficient devotion. “Presumptuous devotion,” for example, thinks that just a few prayers (or, perhaps, a few external devotions, whether scapulars and chains or thoughtless rosaries and consecrations) absolves us of the need for a real spiritual life. “Presumptuous” false devotion is different from “scrupulous” false devotion in the sense that one thinks devotion to Mary is too powerful, and the other thinks it’s too weak. But they are the same in that neither one is truly devoted. “True devotion” doesn’t mean saying a couple prayers, or a consecration, and thinking you have your bases covered. True devotion, he says, is “interior, trustful, holy, constant, and disinterested.” True devotion is a “slavery of love” – slavery in the sense that we give our whole selves for love, instead of maintaining our “right” to think more of ourselves than of God. Presumptous devotion might think that consecrating ourselves to Mary is really valuable – but it fails by failing to be in love. At the end of the book, he says true devotion means living our whole life “through Mary, with Mary, in Mary, and for Mary.” Perhaps another time, we can dig into what these formulas mean. For now, the point is that true devotion means transformation. It means taking Jesus as our all – de Montfort’s personal motto was “God Alone!” And it means taking Mary as a means of focusing our lives more totally on Jesus. True devotion is not a consecration formula that we follow once and then forget. True devotion is a life transformed. How could you make Jesus a bigger part of your day?